Andrew: Let’s talk about doctors in the media business. Dr. Phil, Dr. Drew, and Dr. Oz are veritable personalities who host TV and radio shows in which they give advice to people They have large fan bases, who tune in to see them tell people how to better themselves and, as an extension therefrom, learn how to better themselves. But are these people trustworthy? They aren’t just doctors, they are media personalities, and that means that they have advertisers to keep happy. So how much of their advice is based in a patient’s best interests and how much of it is based on their sponsors’ best interests? This is something that worries Frasier in the episode “Selling Out.” He reasons that he’s a doctor first and foremost, and he worries that people will take his endorsements more seriously than they would from someone like Bulldog because he’s a doctor. Fortunately for the citizens of Seattle, Frasier’s endorsements are for restaurants, hot tubs, and nuts, rather than medical treatments, but the episode humorously examines how money it will take for Frasier to betray his principles. “Selling Out” introduces Bebe Glazer, who will become Frasier’s agent over the course of the series. Harriet Samson Harris wonderfully plays her with over-the-top speech patterns (replacing r’s with h’s) and a distinct lack of a soul, Bebe is a woman who sees limitless potential in the money-making power of Frasier’s silky-smooth baritone. And she’ll whatever underhanded tactic necessary to get him to see things from her point of view. Both episodes this week have great guest stars, but while Bebe will recur throughout the series, John Glover’s Ned Miller will sadly never appear (and, if memory serves, even be mentioned) again. In “Oops,” Glover plays the psychotic station manager that Frasier has to confront after he repeats an office rumor in front of Bulldog that convinces the hotheaded sportscaster to quit KACL in the most undiplomatic way possible. 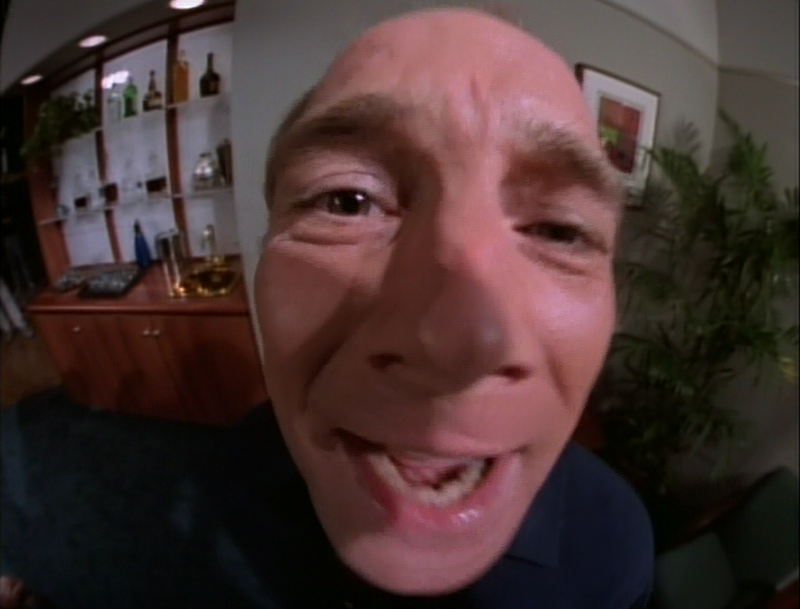 Glover only has one scene, but he fills it with so much menace and sneering satisfaction that I was reminded why he was the best part of Smallville. We have never heard of Ned Miller before this episode, and we’ll never see him again, so Glover really needed to deliver on the performance to justify Frasier’s fear of the man. 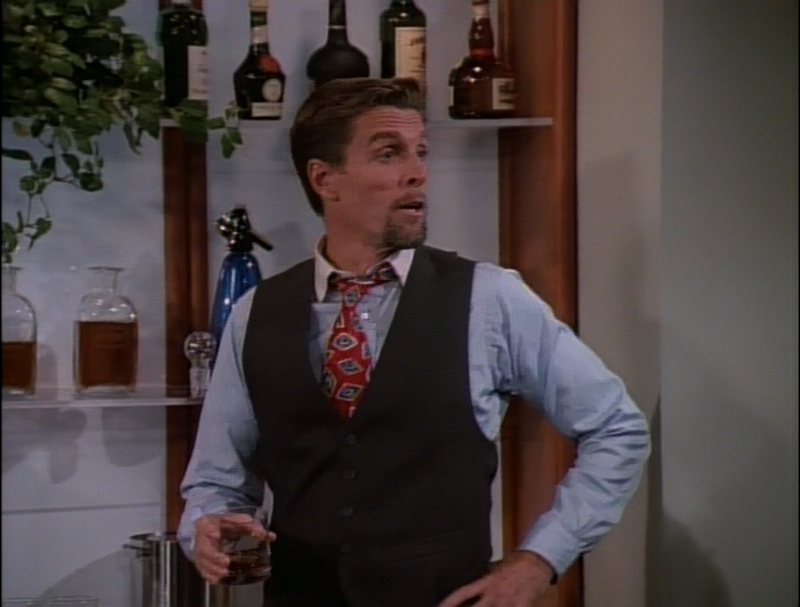 On the other hand, while I always love watching John Glover perform, the Ned Miller character seems like either a weird exception or a lost opportunity for Frasier. Out of the blue, this one-dimensional villain is introduced then dispensed with. The resolution to the story, in which the station decides to terminate Miller instead of Frasier or Bulldog, is a quick and easy way to get rid of someone who could have been a good antagonist for Frasier and Roz. 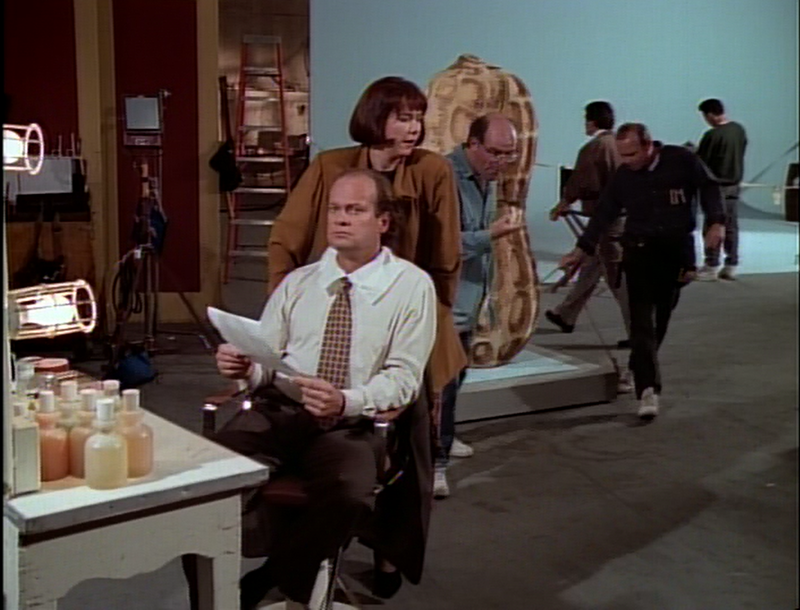 And Frasier instantly forgets his fear of the man who put Bulldog’s head through a wall once Miller is fired. Ashley: I like “Selling Out” because we get to meet Bebe (to get her to appear you just draw a pentagram and chant “I Summon Thee” three times), the cunning silver-tongued agent. Furthermore, Frasier’s career gets its first glimpse of show business. But, per usual, Frasier is driven by his ethics, and like you said, he worries how his audience will interpret his endorsements. Bebe is a wonderful character. I always enjoyed episodes with her and to me she was the devil on Frasier’s shoulder. She’s theatrical and delightfully ruthless and this makes her the perfect agent (not a pimp). Bebe is a benevolent villain and I do love a good villain. You can almost hear her teasing Frasier with a mantra of “Come to the Dark Side. It’ll pay for Frederick’s tuition”. Frasier, though, does his research with each endorsement and comes to like each of them, except for the nuts. How do you think he came to the conclusion not to go through with it? I’m sadly not as familiar with John Glover as you are so I have little to say on the actor himself and his portrayal as Ned Miller. He is, however, the first of the station managers we meet and the most maniacal. “Oops” is a great example of how office gossip can ruin someone’s career. I think all of us can relate to the “pipeline” in our own workplaces. Even Father Mike gets in on the action, asking if anyone’s spoken for Bulldog’s parking space. Father Mike was an interesting character and he just sort of disappeared from the series. KACL has such a diverse set of on-air talent which makes the series all the more interesting. But seriously, where did Father Mike go? This episode also gave great exposure to Bulldog and his personality. He’s a cocky, hot-headed womanizer who does ridiculous things on his show for ratings (as in “Selling Out” his horribly racist Asian accent to promote Hunan Palace). Combine him with Ned Miller and it’s a pretty good fight. Andrew: One of Frasier‘s many strengths is its ability to randomly and quickly throw out absurd little gags, and the KACL on-air talent roster is a good one. In addition to having Father Mike, the station boasts such talent as Ray the Green Grocer. I mean, what the hell is his show about? Little things like these names or Niles’ various seminars (I couldn’t find a way to bring up his “Healing With Humor” seminar last week, in which he no doubt dressed as Sideshow Cecil; this week, he attends a multiple personality disorder seminar, and it takes forever to fill out the nametags) are inconsequential to the series overall, but add so many hilarious details. Not only did we see new depths to which Bulldog would sink for ratings and money this week, we also saw that, beneath the bravado, he is very human. The flawed, from Roz and Frasier’s (and our) perspective, front he puts up is a mask meant to shield a frightened, insecure man with little to offer people other than his famous name. As for the racism bit, I was extremely happy to see that his racist Chinese restaurant ad was a joke at Bulldog’s expense. We are supposed to laugh at him, which is underscored by Roz’s worry that Bulldog’s antics will finally result in a lawsuit against KACL. It remains perplexing to me that, in 2013, many sitcoms still resort to lowest common denominator racist humor (hello, Two and a Half Men, 2 Broke Girls, and Dads). The fact that, 10 years ago (almost to the month), a sitcom on network TV would refuse to indulge in such an easy laugh is quite refreshing. As for Frasier’s foray into the advertising world, I think that his decision not to do the television ad was a combination of both his ethics (one of his positive qualities) and his vanity (one of his negative qualities). He was having misgivings ever since he agreed to endorse a product he didn’t believe in, and the line about him “knowing a nut when he sees one” clearly gave him misgivings as it trivialized and made a punchline out of mental illness. But the “Frasier comes out of his shell” element of the ad was the last straw. On the family side, we learn about Daphne’s history as childhood TV star of the series Mind Your Knickers, and Martin shows that he’s just as adept as Frasier at making intellectual zingers. 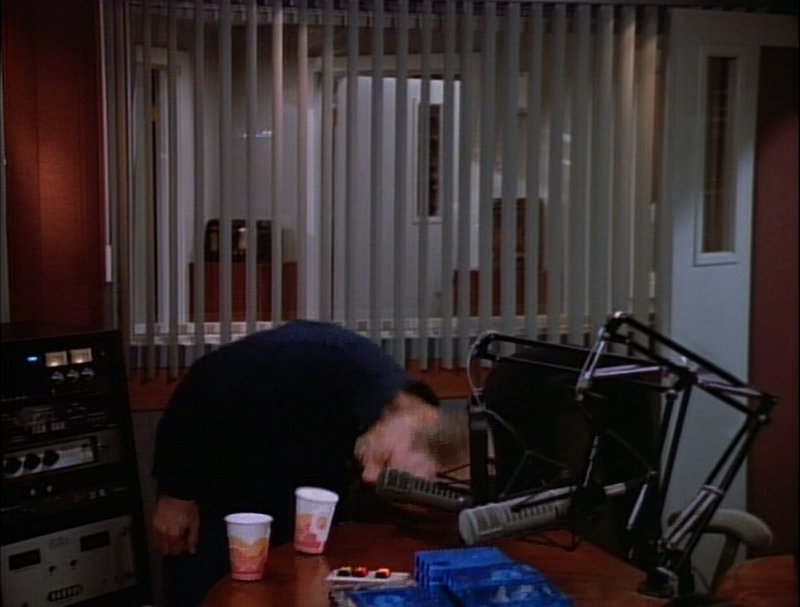 “Selling Out” opens with Frasier making a long-winded, but hilarious, put-down of a caller with what can barely be called a problem by stating that Frasier could not find his ability to care about the caller’s problem with a super-powerful microscope. 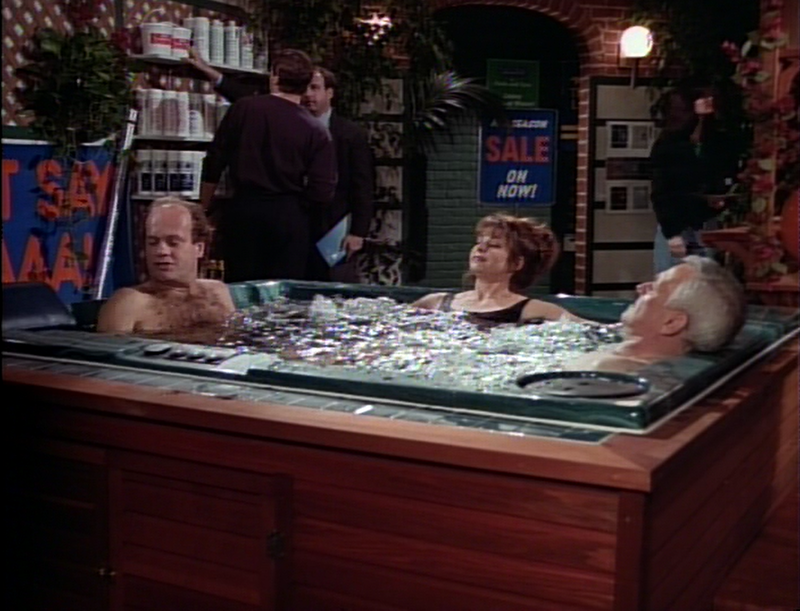 Later, when Frasier mentions that the hot tub he is endorsing is made from the same heat-resistant materials as the space shuttle, Martin dead-pans that he’ll keep that in mind when he uses the hot tub to reenter the Earth’s atmosphere. We also learn a little bit more about the weird marriage of Niles and Maris Crane when Niles reveals that he and his wife sleep in separate bedrooms. 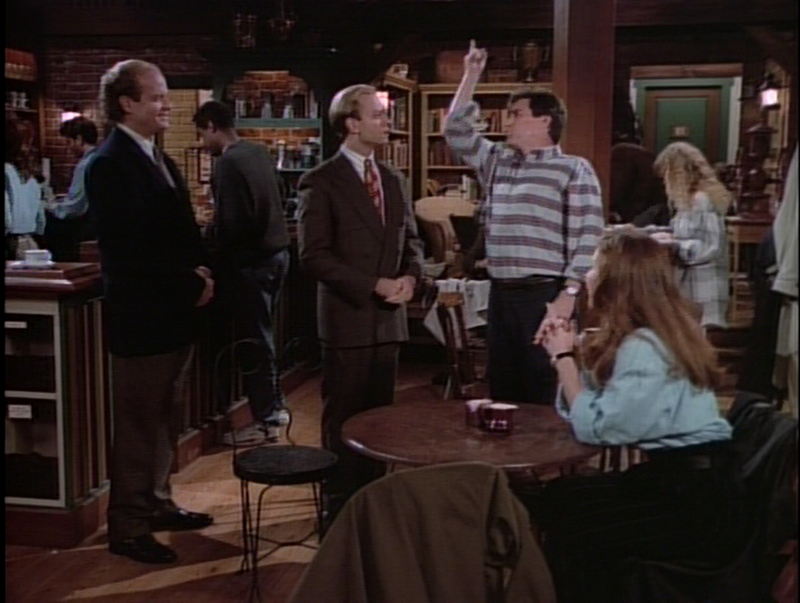 And the gossip story is a fun way of showing that Frasier can be both very rational and sympathetic to a fault. When the other KACL employees deduce, based on evidence that wouldn’t be called “circumstantial” on a good day, that Bulldog is going to get the ax, Frasier points out how flawed their reasoning is. But when Father Mike expresses fear that he’s the one to be fired, Frasier tries to reassure him by telling him that Bulldog is the one in trouble. Ashley: Frasier’s opening monologue in “Selling Out” is one of my favorite openings in my television watching history. I absolutely love that he takes the time to formulate an insult (and thus wasting the caller’s time like he wasted Frasier’s describing the issue) that doesn’t sound like one until we get the punchline. This to me is great humor. It’s also a wondeful way to demonstrate intellectual prowess and we all know Frasier is brimming with it. Martin has been pretty dead pan to me since the beginning, like his sarcastic remark in “The Good Son” about the Space Needle (“Having been born and raised here…”). I just don’t think he uses it to show off like Frasier does. I’m not a talk radio fan but you’re right, just what the hell is Ray the Green Grocer’s show about? I’ve noticed we haven’t met Gil Chesterton yet and his show is right up my alley (it’s food; what’s not to like?). The rest of the shows exist around Frasier but I always thought about what they would be like (Bonnie Weems, Father Mike, etc.). I always imagined KACL to be a PBS-like radio station except their on-air talent makes considerable money compared to a public radio station. I do wonder, however, about Ned Miller being fired. I know in later episodes we’ll get another station manager so the logic of firing someone who makes that kind of money (and essentially runs the station) doesn’t make too much sense to me. Office gossip is dangerous stuff and I love how “Oops” escalates the situation to the highest level wherein the miscommunication leads to Bulldog losing his cool and quitting his job. Watching Bulldog go off on Ned Miller with the dog barking sound effects was brilliant. I think Roz’s initial description of the story is great hyperbole. In real life I don’t think we’d get an example of a story going through that many people. The description itself and Chopper Dave yelling the “hush hush” facts adds another level of absurdity to the whole situation. Furthermore, Frasier claiming Bulldog’s parking space before the story even comes to light is delightful. I myself was caught in the middle of a similar situation. I’m transitioning to a new position and the office gossip was bouncing off the walls as to who would be my replacement. This news came to light during my vacation when I wasn’t around. When someone walks up to you and says “I’m really going to miss you” right after you’ve returned from a week off and you have no idea what they’re talking about (because how would they know I was leaving? ), I don’t know about you, but I panicked a little. Later however, some people came up to me and said “Oh, I heard [insert name] was your replacement.” I probably heard about 3 or 4 different versions of this story. It’s been since straightened out but not before half the staff got the whole thing wrong. “Oops” is a fine episode, with good shading of Bulldog, but your comments about it deepening Frasier’s world and laying the groundwork for the future. It pulls back and reminds us that Frasier will have to deal with office politics, ratings quests, and appeasing the powers-that-be. Niles may be overly dismissive of Frasier’s role as a radio psychiatrist, but he’s not wrong when he says that Frasier is now in the entertainment business. For better or for worse, Frasier is now just as much an entertainer as he is a doctor.